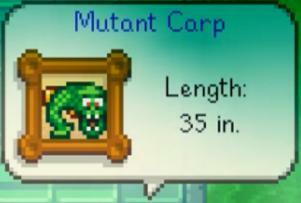 The Mutant Carp is either the first or second legendary fish accessible to you. It can be caught during any season, with or without rain. To catch it, you must get 60 items donated to the museum and recieve the Rusty Key if you haven't already. Then, you must enter the sewers. In my opinion, you should be at least fishing level 6 before trying to catch this fish. 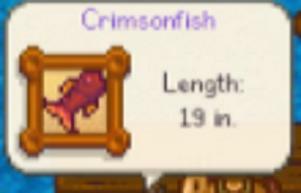 The Crimsonfish is the either the first or second legendary fish accessible to you. It can be caught during summer, with or without rain. To catch it, you must go to the beach, fix the bridge there if you haven't yet, and go to the far right pier. Start fishing here. In my opinion, you should be at least fishing level 6 before trying to catch this fish. The Angler the third legendary fish accessible to you. It can be caught during fall, with or without rain. 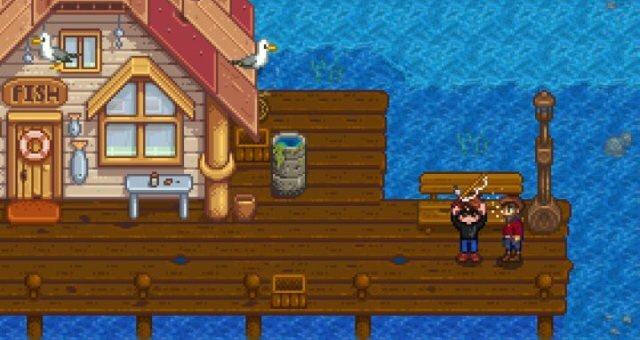 To catch it, you must go to Pelican Town, and travel behind JojaMart. When you reach the bridge at the top corner of the area, start fishing. In my opinion, you should be at least fishing level 7 before trying to catch this fish. 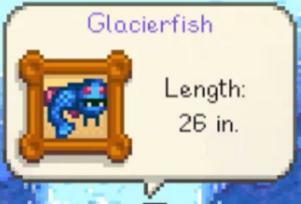 The Glacierfish the fourth legendary fish accessible to you. It can be caught during winter, with or without snow. To catch it, you must go to the non-town entrance of the sewers. When you reach the the island, go to the island directly to the left of it. Walk to the southern tip of the island and start fishing. 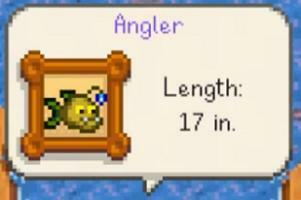 In my opinion, you should be at least fishing level 8 before trying to catch this fish. The Legend the final legendary fish accessible to you. It can be caught during spring, with rain. To catch it, you must go to the lake in front of the mines. Go to the island in the middle, and fish directly south, and make sure your bobber is on or near the big log under the water. 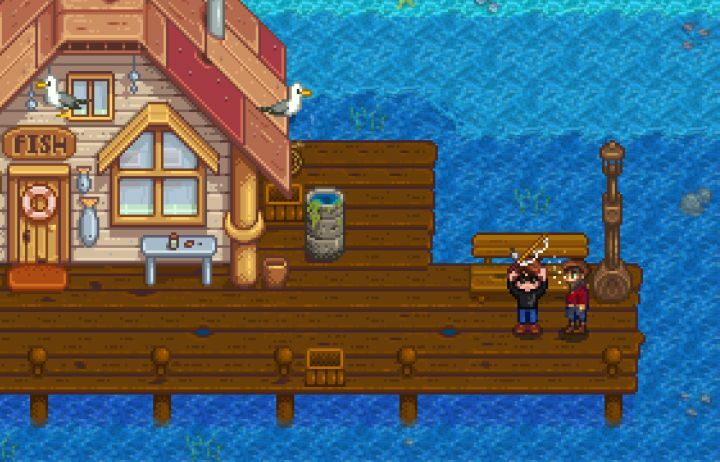 To catch this fish, you need to be a fishing level 10, and you must eat something that will give you +3 fishing or more. I don't have a reccomended fishing level because you have to be level 13 anyways. 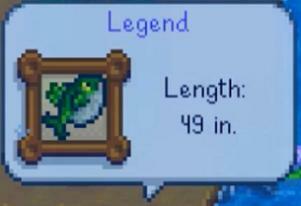 The Legend is the only legendary fish that can be caught more than once.